The tragic death of a toddler has saved the life of a one-year-old girl. camera (Amie Martin/Jamie Heard ) Ava Martin, left, 18 months, received a heart donation from William Heard, 2, on December 14. The tragic death of a young boy has saved the life of a 1-year-old girl 400 miles away after she received his heart. 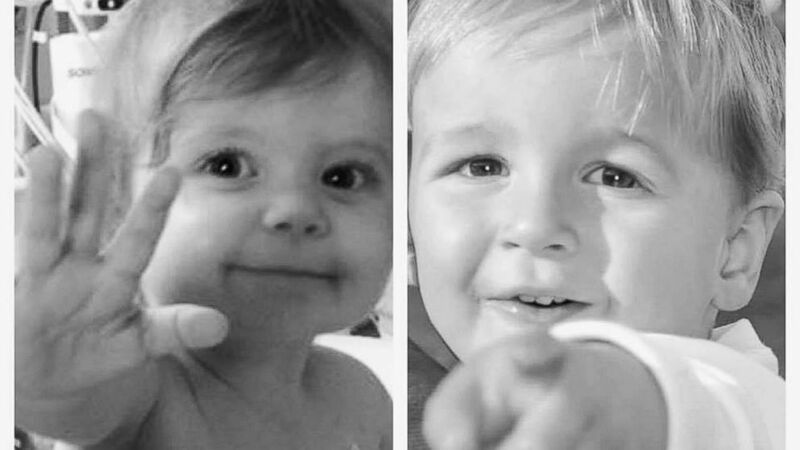 Now, the mothers of Ava Martin, 1, and William Heard, 2, are planning to meet face-to-face after connecting on social media. "Aime [Ava's mom] she said one of the first thing she did was listened to his heart [in her chest]," William's mother Jamie Heard of Brentwood, Tennessee, told ABC News. "It was really cool to know that she was listening to the same heart. It'll be a special moment to hug Ava and know that William was able to provide life for her." Heard, 32, said it was on Dec. 11 when her son's nanny called paramedics after he choked on a piece of chicken. William was brought to a children's hospital in Nashville where they dislodged the food, but the toddler died two days later, after being placed on life support. "He was just the greatest kid," Heard said. "He was 100 percent 'boy' all the time, but he had such a sweet demeanor. He loved to love. It's quiet in our house now. He just filled the room with a such a joy that’s making it difficult to be at home." Following William's death, Heard said she and her husband Daniel were approached with the option to donate his organs. "We felt so good about it and we thought it was an answered prayer that we were able to give a gift from our tragedy and able to help someone else," she said. "His liver, kidneys and heart were all matched." William's heart went to Ava Martin, another toddler living over 400 miles away in La Grange, Illinois. "When we were pregnant with Ava, we found out that she was going to have some congenital heart defects," her mom, Amie Martin, 33, told ABC News. "She had two open hearts. One when she was 7 days old, to correct an issue with her aorta, and another at 7 months old to help correct septal defects." At 13 months old, Ava was diagnosed with heart failure and was soon admitted into the ICU. After waiting for a total of 118 days, the Martin family got a call that Ava would be receiving a new heart from William. On Dec. 14, Ava had surgery to replace her heart with William's, giving her a second chance at life. "[My husband] Brian and I are very thankful for the gift that they gave to our daughter they did a very selfless thing by giving life to another child, even in their darkest times," Martin said. "We are just in awe of their strength...there are not a whole lot of words to express our gratitude towards them." After the operation, a mutual friend put Heard in touch with Martin, who contacted her via Facebook message. The two families are planning to meet once Ava recovers from the transplant. A previous version of this story said Heard was from Texas. He was from Tennessee.